LAN parties were a major source of entertainment during my teenage years. The weekend-long events that took place once or twice a year would involve half a dozen or so close friends, mounds of junk food and hours upon hours of gaming. While fun, they pale in comparison to what took place in Jonkoping, Sweden, over the weekend. Dreamhack Winter started way back in 1994 when a few guys rented out a school hall to play video games. The event has since morphed into the world’s largest LAN party as more than 25,000 people came together for the fun-filled, four-day event. The massive LAN party set a new record this year with 22,483 unique devices (computers) registered and a total attendance of 26,672, an increase of nearly 2,000 people compared to last year’s event. Gaming was obviously the key focus with titles like Counter-Strike, StarCraft and DOTA getting lots of play but what makes Dreamhack Winter special is that it isn’t all about games. The venue also had a live DJ booth and an impressive cosplay competition. I recall it taking nearly a day to get our small LAN set up which included installing games troubleshooting various issues; I can only imagine the nightmare of connecting over 22,000 PCs but based on the photos, everything seems to have gone smoothly. 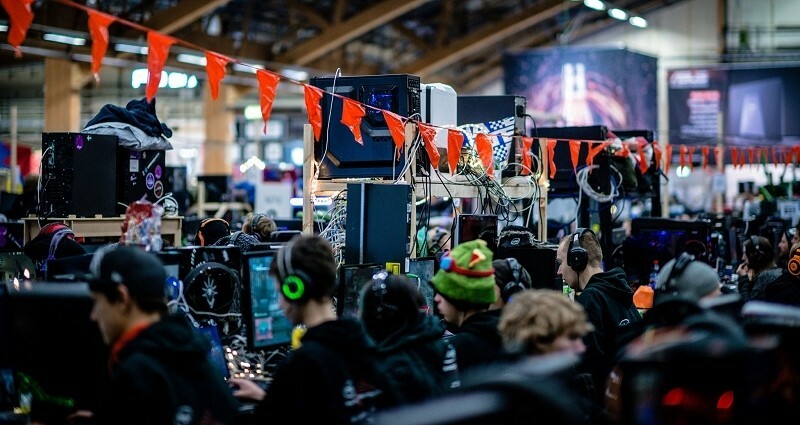 Have you ever attended a massive LAN party like this or do you even bother with them now that Internet gaming (and console gaming) is as accepted as it is?